When Facebook first converted to the Timeline format with the huge Facebook cover photo space at the top of the page, we were stumped. This is the solution we came up with. It's fast, easy and free. Here's how to create an attractive word cloud using Wordle and use it as a Facebook cover in just four steps. 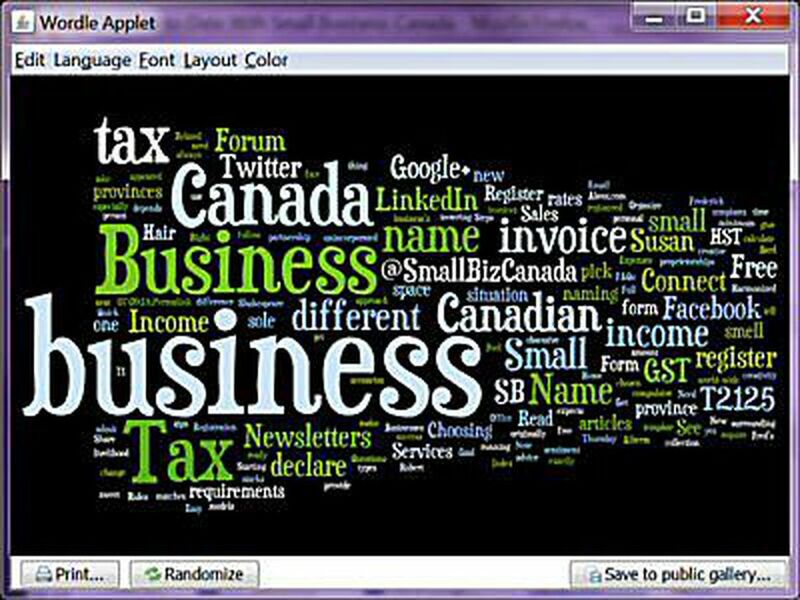 Note that Wordle allows you to create a word cloud by pasting or typing text in the text box or by entering the URL of any blog, blog feed, or any other web page that has an Atom or RSS feed or by entering a del.icio.us user name to see their tags. The great thing about Wordle is that it lets you play with the results. The Language menu lets you eliminate common words, remove numbers and change the case so you can use all upper or lower case words if you like. The Font menu has a good selection of different fonts for you to choose from. The Layout menu makes it easy for you to switch to different vertical and horizontal layouts, set rounder or straighter edges, or set alphabetical order or a maximum number of words. While the Color menu has a limited number of palettes to choose from, you are able to customize a palette if you prefer. Step 2: Choose the Open in Window button at the bottom left of the Wordle window to open your chosen Wordle in a separate window. Then use your PrintScreen function on your keyboard to create a screenshot of your Wordle. On my keyboard, this is +Alt+PrtScn to create a screenshot of the selected window. Step 3: Open your favorite photo editor and paste in your Wordle screenshot as a new image. Then you can crop and resize your image to fit the requirements of the Facebook cover. The actual size of the Facebook cover is 851 x 315 pixels but it will stretch to size when you upload an image as long as your image is a minimum of 720 pixels wide. In this example, I am using the Microsoft Editor 2010 Photo Editor but any photo editing software will do as long as you can crop and resize. Save your image when you are done. Step 4: Add a cover to your Facebook page. Open your Facebook page in Timeline view. If your Admin Panel is open, scroll down to find the space where it says ‘Add a Cover’ on your Facebook page. If you already have a cover, you will have to mouse over the Cover image to get the 'Change Cover' control to show. Then choose 'upload a new photo' and upload the Wordle image you saved. Once you've positioned it the way you would like, click 'Save'.